The Electric Pressure Washer makes your household chores easier. Featuring a hassle-free installation with trigger spray gun, nozzle wand, water hose that measures 25 ft, 35 ft power cord and weighs 23 lbs. Aside from that, it has built in universal threaded connectors and can be used vertically or horizontally for greater stability during use. Moreover, our hose will save more water while using less power. 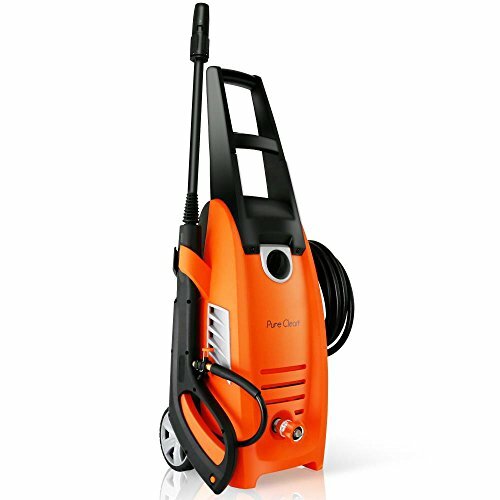 The kit includes a professional style pressure washer gun, pressure washer wands, power hose, rolling wheels and a universal thread connector. This can be used at home, on the driveway, car, concrete, deck, window, and trucks. It ensures accurate PSI and GPM ratings. Water Hose Length: 25’ ft.
Power Cord Length: 35.0’ ft.